Background: Laparoscopic surgery has increased the complexity of the operating room (OR) environment and thereby enlarged the potential for errors and technology related problems. The potential for errors may be minimized through the use of preoperative checklists to standardize the work process. A structured and thorough preparation of the OR is likely to reduce preparation time and decrease technical problems during surgical procedures. 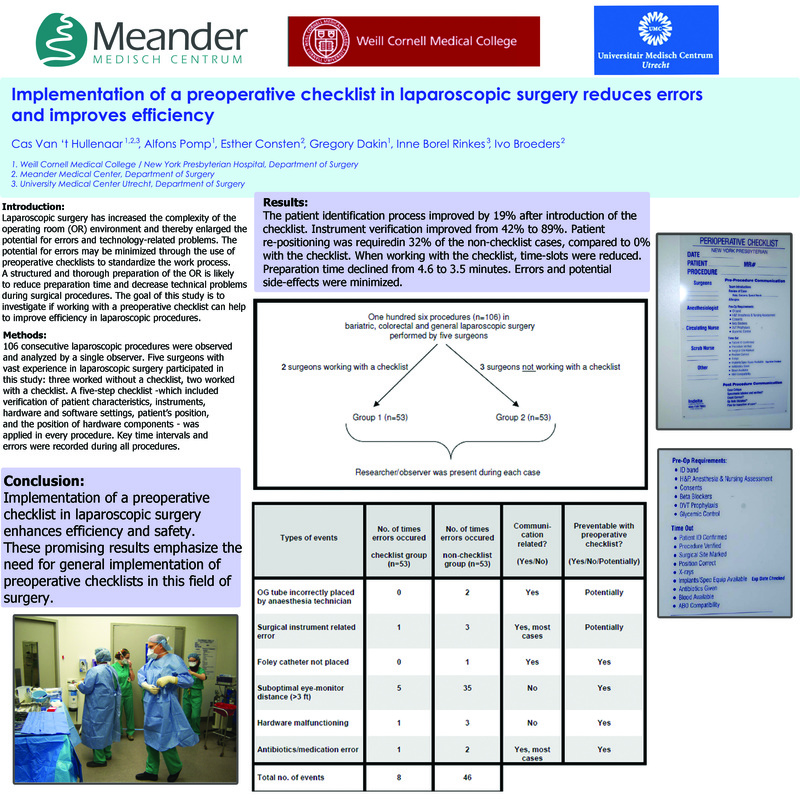 The goal of this study is to investigate if working with a preoperative checklist can help to improve efficiency in laparoscopic procedures. Methods: 106 consecutive laparoscopic procedures were observed and analyzed by a single observer. Five surgeons with vast experience in laparoscopic surgery participated in this study: three worked without a checklist, two worked with a checklist. A five-step checklist – which included verification of patient characteristics, instruments, hardware and software settings, patient’s position, and the position of hardware components – was applied in every procedure. Key time intervals and errors were recorded during all procedures. Results: The patient identification process improved by 19% after introduction of the checklist. Instrument verification improved from 42% to 89%. Patient re-positioning was required in 32% of the non-checklist cases, compared to 0% with the checklist. When working with the checklist, time-slots were reduced. Preparation time declined from 4.6 to 3.5 minutes. Errors and potential side-effects were minimized. Conclusion: Implementation of a preoperative checklist in laparoscopic surgery enhances efficiency and safety. These promising results emphasize the need for general implementation of preoperative checklists in this field of surgery.